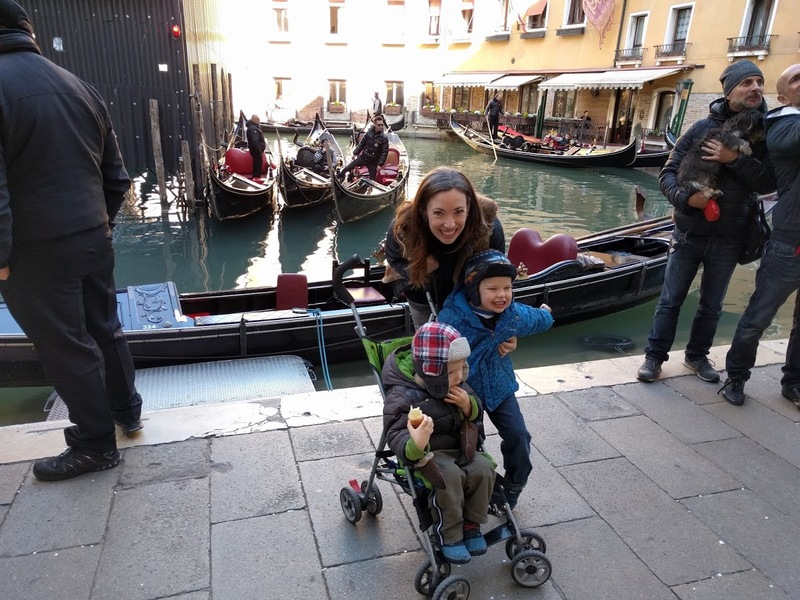 Should you bring a stroller to Venice? This year we hit up Venice for Carnival. It was amazing. I hope to share more, at least pics, soon. But in case I don’t get around to it because the Year of Togetherness has decimated blogging around here, I at least wanted to address something that I wondered a lot about before our trip. I’m talking bout strollers. Should we do no strollers? Two umbrellas? The double? The hiking backpack? I spent more hours than I care to admit pondering what to do about this. The good news is that now I’ve pondered so you don’t have to. Why all the pondering you ask? 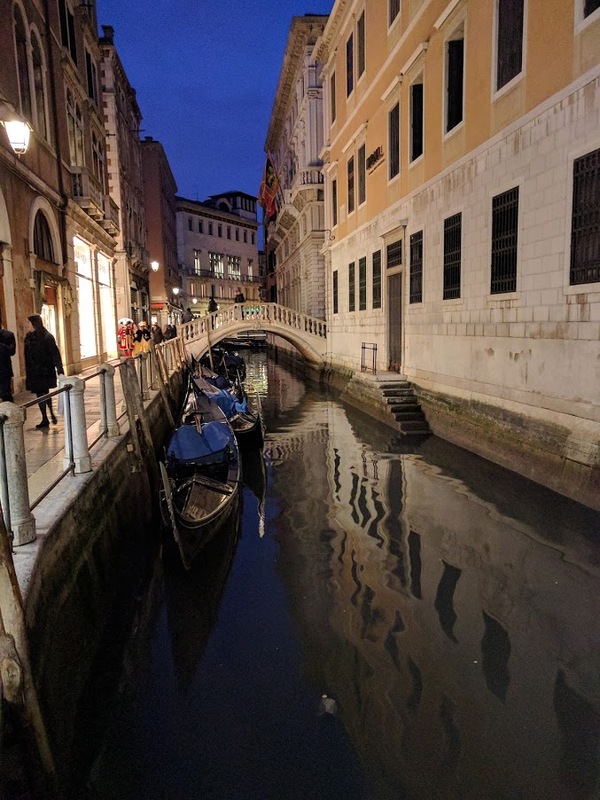 In case you aren’t familiar, Venice has a lot of bridges. Like a lot a lot. You can go decent distances without needing to cross one, and we noticed that the bridge by the Bridge of Sighs has an added ramp. But then you’ll need to cross three narrow ones in fairly rapid succession. You can’t get away from them. I think it all comes down to your kid to adult ratio. Can those adults easily heft the stroller? For one kid to two adults, I wouldn’t hesitate to stroller. Unless you have a teeny tiny baby and you enjoy baby wearing, I’d probably go ahead and take a stroller for a young kid and two adults. Especially if there is a chance that your kid might take a nap while you enjoy some Pinot Grigio on the piazza. It’s nice to have somewhere to put the kid. We saw people semi-frequently doing the two person up and over the bridge. If your kid can walk itself over the canal, I still might take a stroller. This is what we ended up doing. We brought an umbrella stroller that we would push up to the edge of a bridge and then told the kid to get out. This usually worked fairly well. I probably bumped some people holding Mac’s hand and carrying a stroller on the other side on narrow bridges, but it was fine. You do have to think about what to do if the kid falls asleep. Which brings me to my next bit of advice . . .
For more than one kid, think about whether each adult can maneuver a strollered kid over the bridge alone. I discovered I could do this pretty easily with Mac in the umbrella. Henry was a little more tricky. I’m sure you could always do some version of moving the kids over working together and leaving a kid on the other side. But a lot of the bridges were narrow accompanied by narrow streets which means they were sort of choke points. Possibly not the best place to park your kid for a few seconds. Just something to think about. About the Hiking Backpack . . . This was helpful, but I’m always mixed on this thing. I can’t carry it myself. James CAN do it with Henry in it, but not very far. Because we had the one umbrella and the backpack, there always seemed to be tension about who was going to go where. To his credit, Henry did a TON of walking that was incredibly helpful. To his detriment, Mac decided that ALL he wanted to do this trip was to play stroller derby AKA run the empty stroller around himself. It looked like that kid was bowling for tourists. If I’d known this in advance, I might have just skipped the stroller after all. P.S. If are looking to travel light, you could always rent a stroller there. MamaRent looks like a pretty fantastic option. 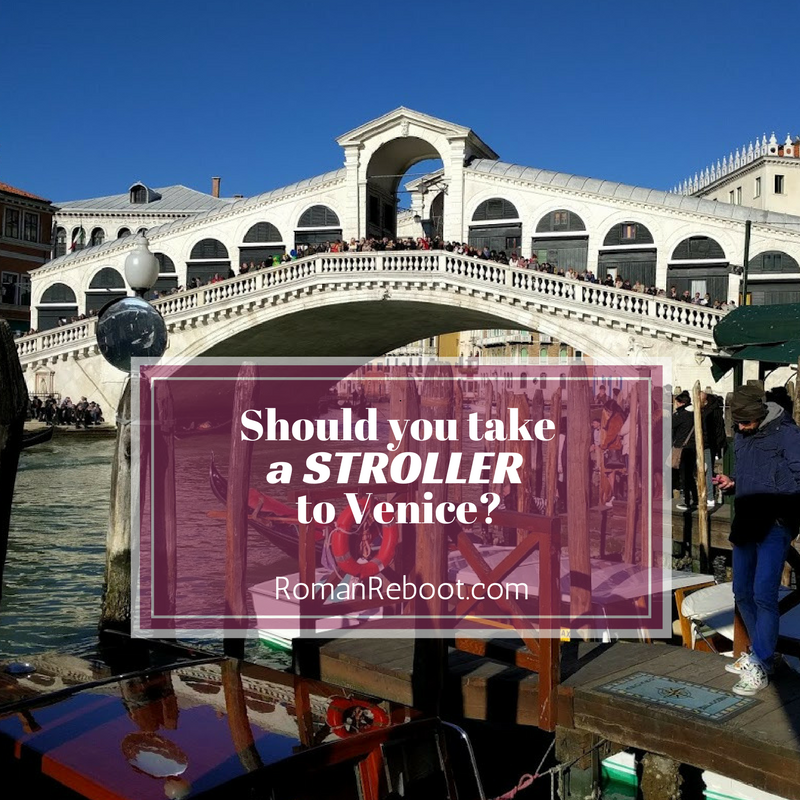 Did you take a stroller to Venice? Did you regret it or glad you did? If you have any other stroller questions for Venezia, just lemme know! I can’t speak to Venice, but our default around here (DC) is no stroller and no carrier. 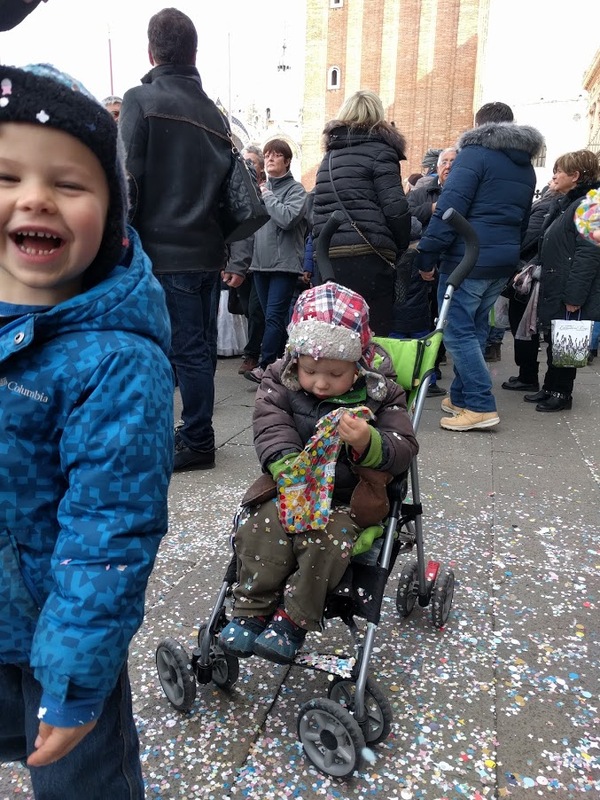 Both kids are good about walking some of the time, and when they’re not – they go up on the strollers. I find that the weight is distributed more easily if they are riding on my shoulders, so I can carry (either one of) them for longer periods of time. 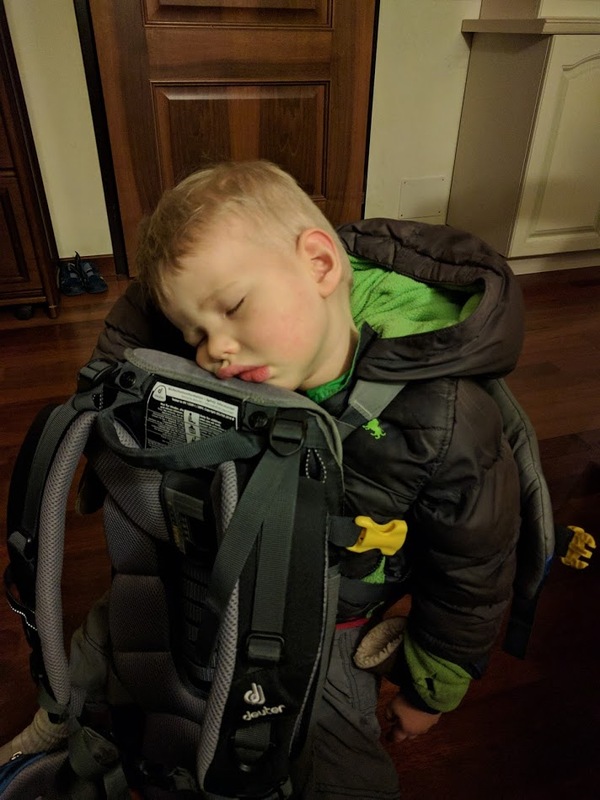 We will occasionally bring the stroller, but I find they either both want to ride in it or both want to push it into strangers in the street – it ends up being easier on everyone to remove those options. Though we’re generally back home for nap time, so that changes the calculus certainly. Great to think about. I’m trying to figure out what on earth we’re going to do when home this summer. I’m less scared of no stroller with James around, but I don’t know if it’s just me. I’d like for both kids to walk more though, and then they don’t get the practice if I keep bringing the stroller and then I’m nervous on not having the stroller. It’s a bad cycle. Ha – whoops. That should say – “when they’re not – they go up on the shoulders” (not strollers). Hi, I liked your post and used it to prepare our trip regarding stroller/ carrier. We’ve just had 3 wonderful days in Venice (end of August). I’d like to add a little advice for other parents with kids. 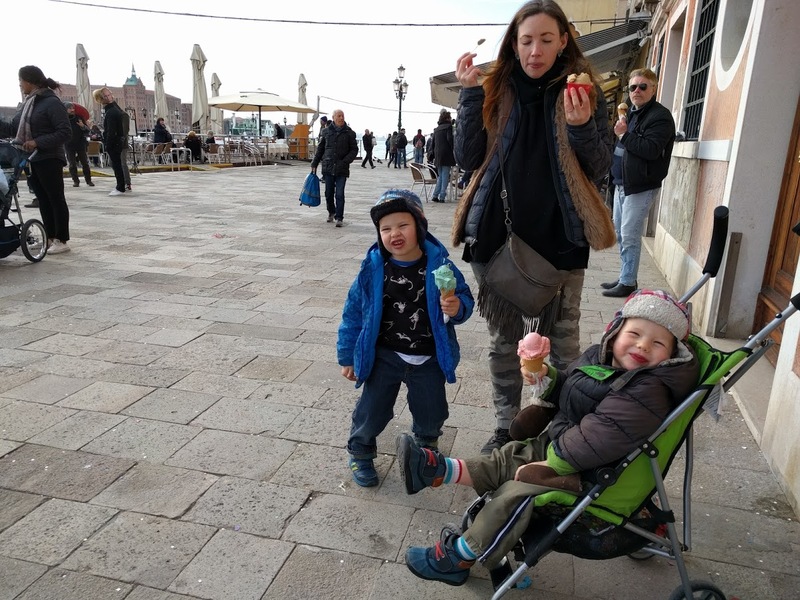 We carried our 11 month old son one day around in a back/front baby carrier and went to all the heavy touristic places and wandered through all the small streets of Venice. Then the next two days we got a busboat-card to go swiftly to the rest of the city and less touristic parts and used the stroller, this mend a lot less lifting. In this way we got the best of both, carrier and stroller. So glad it helped! Yours sounds like a wonderful approach. Wondering if you think bridges were way too narrow for a double stroller? Thank you! Wondering how our behemoth double is going to make it through.